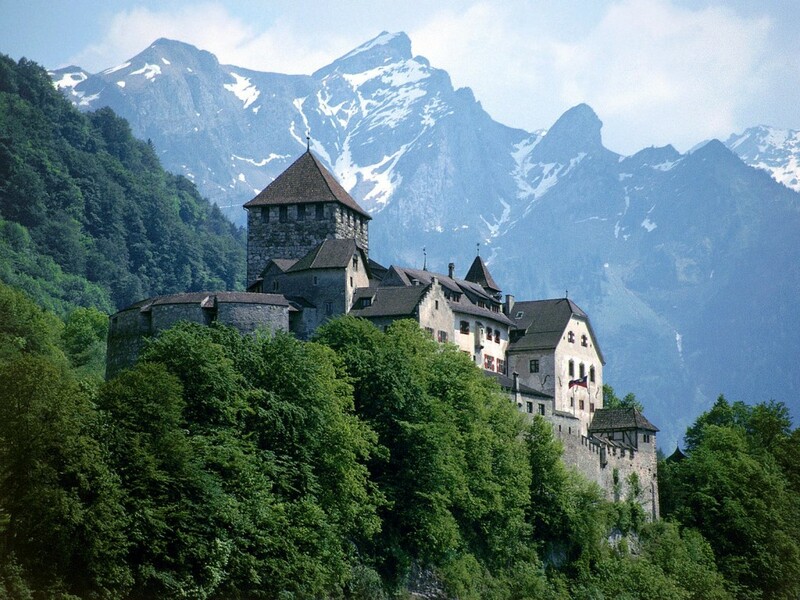 The feudal age of castles is well represented in the Rhine Valley in Switzerland, Liechtenstein, and Austria. Scattered throughout the mountainous terrain and usually near the base of these ranges are numerous remains of the castles and forts that once ruled and dictated this Alpine passage through the upper Rhine region. Three castles still standing and preserved to their medieval form in the valley are the Schloss Werdenberg, Schloss Vaduz and Schloss Schattenburg (schloss is German for “castle”). Almost directly across from each other, Schloss Werdenberg is perched above the Swiss side of the Rhine River and Schloss Vaduz presides over the Liechtenstein capital of Vaduz, on the Liechtenstein side of the Rhine River. Above the Ill River, Schattenburg sits atop a hill overlooking the Austrian city of Felkirch, situated also on the eastern side of the river. Although now in different countries, the histories of these three castles are intertwined. In the Middle Ages, Werdenberg was a county of the Holy Roman Empire which was situated on either side of the Rhine, including parts of what now consists of the Canton of St. Gallen in Switzerland, Liechtenstein and Vorarlberg in Austria. 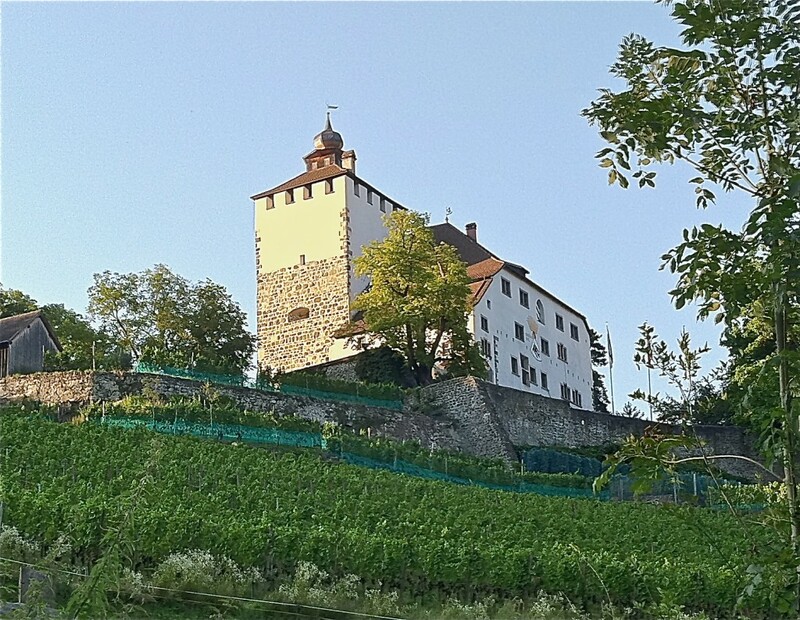 The Werdenberg Castle, from which the county was named, is located today in the small municipality of Werdenberg in St. Gallen, the town also named after the castle. It is at this moment in time that our story begins, when each of the castles were constructed. Although the exact construction date of the Schloss Werdenberg is unknown, the Bergfried, or the Keep as it is known in English, dates prior to 1228. The Keep´s slightly trapezoidal floor plan measures approximately 11 meters around the exterior of the tower and is consistently two feet thick. By 1228 the inner wall of the castle was constructed and building flourished until 1695, at which point the castle suffered from a kitchen fire. The castle was reconstructed and then set up as a private resident in the eighteenth century but faced many looters and frequently changing or tangled ownership. 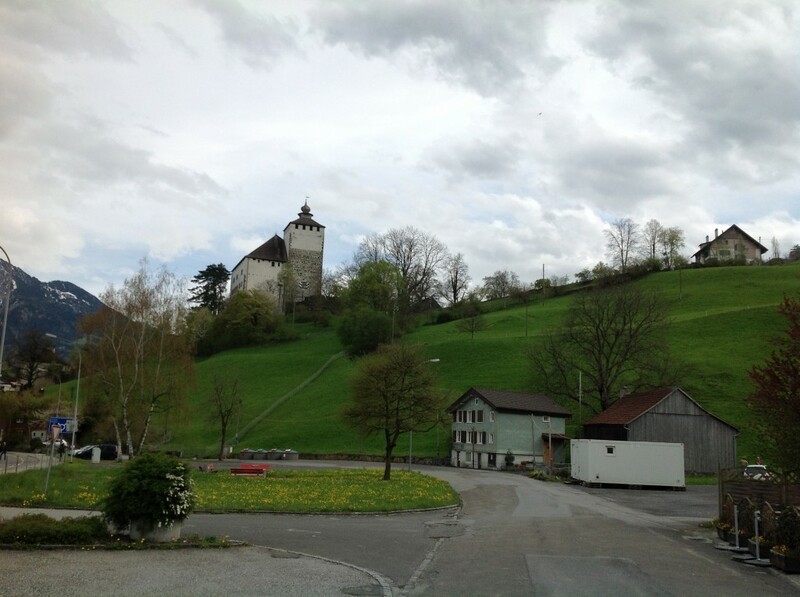 In 1835 the Hilty family acquired the castle and it remained in the family until 1956, when Ms. Freida Hilty, the last remaining heir, left it to the Canton of St. Gallen. Very few details of the castle´s history are known; however, a recent research project has been commissioned by the Office of Historic Buildings of Winterthur which promises to be fruitful. Despite the fact that very little is known, this castle is a prominent landmark to this day to locals and passer-byers alike. It is a picturesque jewel perched atop the historic town of Werdenberg, the oldest timber-frame settlement in Switzerland. The Schloss Vaduz, then known as Farduzes, was mentioned in the deed of the Count Rudolf von Werdenberg-Sargans sale to Ulrich von Matsch in twelfth century manuscripts. 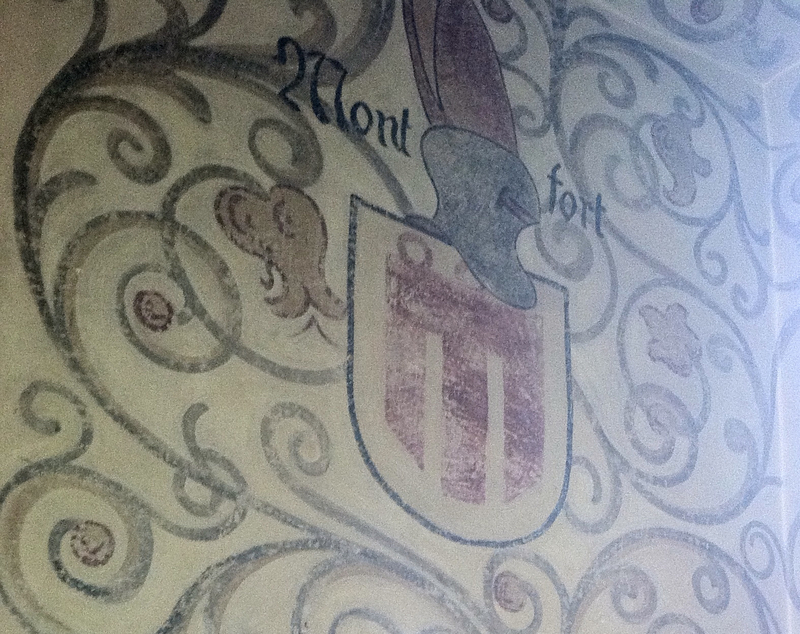 The owners and builders of the castle were the Counts of Werdenberg-Sargans (there is another family castle south in Sargans). The oldest parts of the Castle Vaduz are the Keep and sections of the east side of the building which date to the twelfth century. The Keep measures approximately 12 x 13 meters and has a wall density on the ground floor of up to 4 meters. This castle also faced a large fire in 1499 during the Schwaben War, also known as the Schweizerkrieg or the Swiss War, which was the last major armed conflict between the Old Swiss Confederacy and the House of Habsburg (from which part of my family distantly descends). By the seventeenth century, the Liechtenstein family was attempting to obtain a seat in the Imperial Diet, the Reichstag. 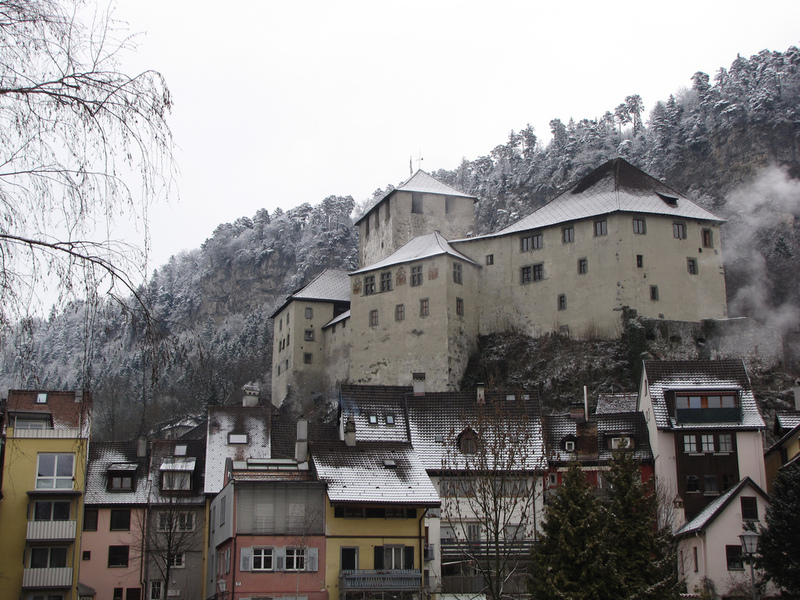 In order to do so, the family acquired Vaduz Castle in 1712 when they purchased the countship of Vaduz. 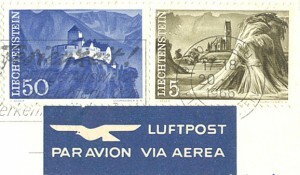 Coincidentally, Charles VI, Holy Roman Emperor, combined the countship of Vaduz with the nearby Lordship of Schellenberg, also purchased by the family in 1699, which together formed the Principality of Liechtenstein. 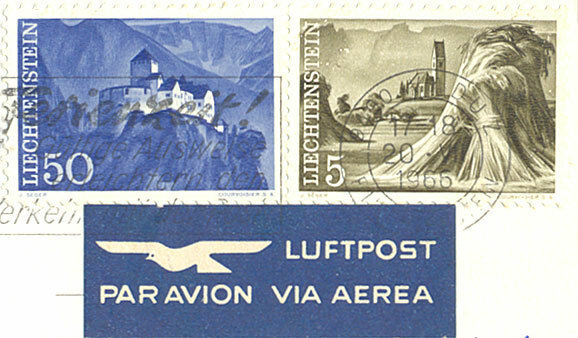 The castle remains to this day as the primary residence of Liechtenstein´s Royal Family. The castle has undergone major restorations from 1905 to 1920, was expanded in the 1930s, and then restored again in the early 2000s. Not far north from these Swiss and Liechtenstein castles is the comparable Schloss Schattenburg in Feldkirch, gateway to Austria’s westernmost Vorarlberg province. Schattenburg was built by Count Hugo I von Montfort, also the founder of Feldkirch, in approximately 1200 to similarly secure the traffic passing through the nearby mountain routes. The 21-meter battlements, the keep, moats, drawbridges, and thick walls, were the first to be constructed. It served as the family seat of the Earls of Montfort-Feldkirch until 1390, at which point it was the Habsburg´s fortress for their bailiffs. In the eighteenth and nineteenth centuries, the castle started to dilapidate and was consistently up for auction. 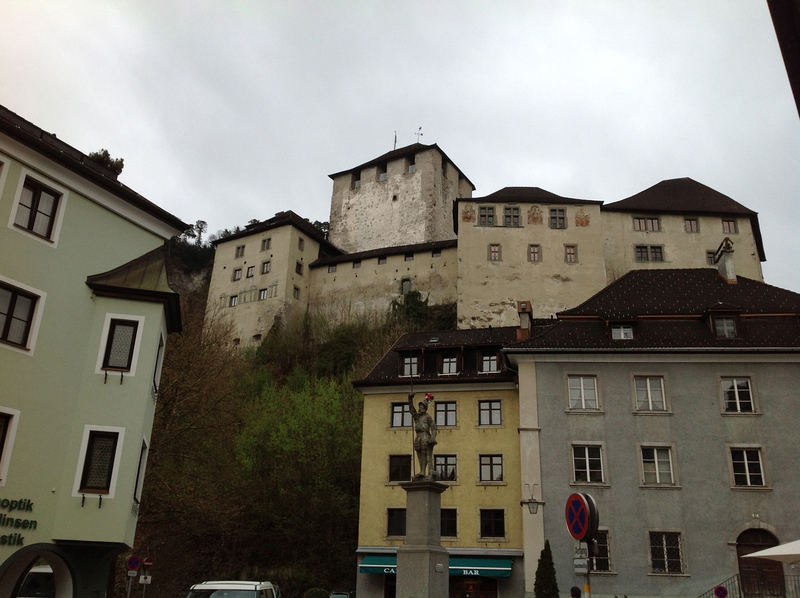 The town of Feldkirch bought the castle in 1825 for 833 guilders and used the structure as barracks and then as a factory workhouse. 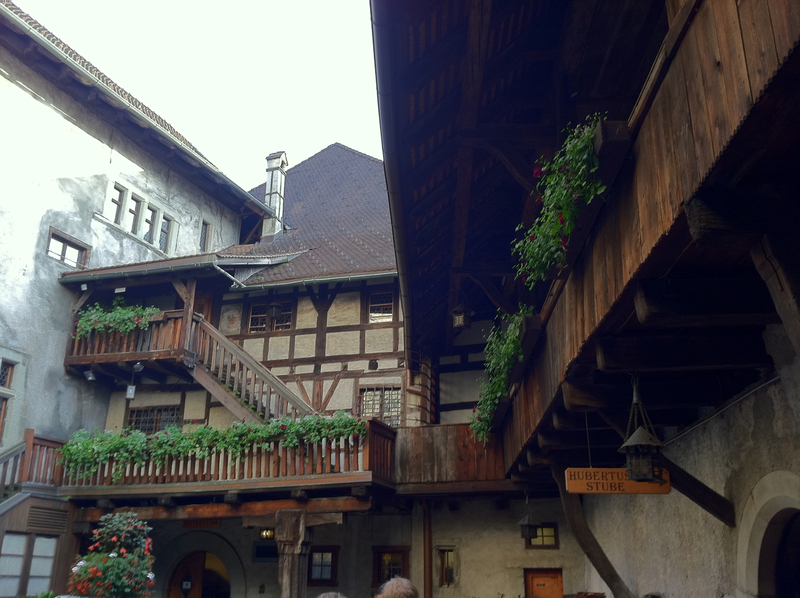 The Feldkirch and District´s Museum and Folklore Preservation Society, founded in 1912, was then able to restore the castle to its original stature. The interior courtyard of the Schattenburg keep is easily visited with its restored wooden battlements and half-timbered buildings added on since the thirteenth century. 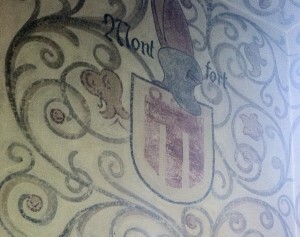 Leaded windows and heraldic devices are painted on the inner walls of the old hunting hall, actually a ‘Knights Room’ (Rittersaal) also now housing a popular restaurant – highly regarded for its many types of tasty schnitzel which this author can verify from various festive occasions – along with a cellar (Burgkeller) and the castle’s museum. These three picturesque upper Rhine castles all date originally from the twelfth to thirteenth centuries – the great age of castle building – in the mostly square conservative style of towers even though the Crusades introduced Europeans to the more easily defendable round towers of Saracen forts. They may also demonstrate that guarding the Rhine River valley wasn’t just a defensive proposition: they also likely demanded tariffs from travelers and merchants passing through their domains, thus giving a new meaning to robber barons. Fortunately, these three castles have withstood the test of time and a visit to each of them is highly recommended for an exciting glimpse into medieval life. Gerhard Köbler, ‘Werdenberg (Grafschaft)’, in: Historisches Lexikon der deutschen Länder. Die deutschen Territorien vom Mittelalter bis zur Gegenwart 2nd edition Munich 1989.